A kunoichi who appears in the second Naruto Shippuden filler arc. She is the female leader of Orochimaru's subordinates. She uses the unique Crystal Release brand of jutsu. As a child, Guren came from an unknown small village where she was shunned by others because she had unique powers. Later, Orochimaru appeared and destroyed the entire village single-handedly. He was intrigued by Guren's powers and offered for her to come with him. Guren chose to follow him because she envied his power. Quickly, she became one of Orochimaru's most powerful and loyal subordinates. Eventually, she was offered to become one of Orochimaru's future vessels. Guren would also later know that the Nine-Tailed Demon Fox, the mightiest of the Tailed Beasts, had ultimately came into the possesion of the Hidden Leaf Village following the events where the Fourth Hokage sealed it into his recently-born son, but due to the extreme secrecy held within that Village regarding this matter, like everybody else outside of Konoha, Guren was left oblivious about the identity of the powerful demon's container, Naruto Uzumaki, whom she would later encounter, instead coming to the conclusion that the Nine-Tails capture was for the sake of augmenting the Hidden Leafs military power. When Sasuke Uchiha defected from Konohagakure and Kimimaro was no longer a suitable vessel for Orochimaru, Guren became the next best choice in Orochimaru's eyes. Unfortunately by the time she arrived, Orochimaru couldn't wait any longer and instead chose Gen'yumaru. Feeling no longer of use to Orochimaru, Guren went into isolation. It is later revealed that she in fact killed Yukimaru's mother. Guren has shown to be very mysterious, apparently preferring to keep to herself despite having a strong loyalty to Orochimaru. During her introduction, she quickly showed herself to be a remorseless and sadistic person. When told by Kabuto that several prisoners would be fighting to the death, she became ecstatic to hear there would be a slaughter. Guren is also shown to be vain by the fact that when she used her Jade Crystal Mirror technique, she looked at her self and said "Lovely, as always." She has also shown to be very proud. When Naruto offered to carry her she was embarrassed because it was shameful. She is devotedly loyal to Orochimaru, to an almost obsessive state. This devotion was so powerful that she fell into despair when she learned she would not become Orochimaru's next vessel, isolating herself from the shame. 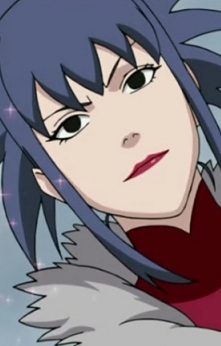 It has also been shown she has a terrible relationship with Kabuto, as the two argue often, trading scathing remarks. Later, she meets Yukimaru, and at first, she finds him peculiar and somewhat irritating. When Yukimaru became ill, she cared for him, watching over him for an entire night, until she fell asleep from exhaustion. When she woke up, she found that she was alone--and went searching for Yukimaru, who she found a little ways outside under a camellia tree. She then develops a sort of friendship with him as she crystallizes a beautiful flower and gently tells him that the flower will never wither as long as she is alive. He tells her that he lost his mother in similar circumstances while going out to find him a red camellia. Guren later comes across a red camellia patch, where she seems prompted to bring him one. Since coming in contact with Yukimaru, Guren seems to be having conflicting emotions. While part of her still wants to be accepted by Orochimaru as his next vessel, another part of her seems unable to let go of the bond she has made with Yukimaru to the point of protecting from even Orochimaru's right-hand man, Kabuto. The emotions seemed to have become more confusing for her in her first one-on-one confrontation with Naruto, who stated bluntly how horrible and selfish a man Orochimaru really is. After realizing the truth behind her past and how it connects her to Yukimaru, Guren feels even more compelled to protect him, out of guilt and repentance for her past sins, as well as love--wishing to become an almost 'surrogate mother' to the boy, to replace the mother she killed. She even goes so far as to turn her protection to Naruto, as they faced off against the small Three-Tails clones within the tailed beast's stomach, telling him she would protect him to the death if he would watch after Yukimaru. This is a great change from her previous interactions with Naruto, where she was stand-offish and combative. Subsequently, Guren has also begun to have doubts over remaining loyal to Orochimaru, due to her grief over the horrible things she was made to do in his name, and the damage and pain he has caused Yukimaru, and herself. To aid him in final preparations for his plan, Orochimaru sends Kabuto to fetch Guren (much to Kabuto's disapproval). Guren attacks him when he approaches her domain, but he is able to avoid her attacks. When asked why she attacked him, Guren states that she just wanted to make sure Kabuto was worthy of being Orochimaru's right-hand man. Upon returning to Orochimaru's hideout, she has hundreds of Orochimaru's prisoners fight to the death and forms a team with the survivors: Rinji, Gozu, Kigiri, Kiho and Nurari. Guren, disapproving of Sasuke's status as Orochimaru's next vessel, is later offered a chance to replace Sasuke if she can prove herself. She and Yukimaru are sent to a certain area. While there, Yukimaru gets sick, forcing Guren to care for him. When he recovers, she is surprised to learn he too knows what it is like to have no one at such a young age and seems to have grown some feelings for him. She then crystallizes one of his flowers, knowing how much he likes them, so it won't wither as long as she is alive. Later when finally meeting back up Team Guren, she leaves Yukimaru at the hideout while she goes out to handle the Team Kurenai. While her men fight Team Kurenai and Kakashi, Guren prepares for their arrival. Once done she has her men fall back, drawing the Konoha ninja into a trap and allowing Guren to encase Hinata in crystal. She uses Hinata as a hostage to prevent her men from being followed. Before anything can be done, Team Yamato arrives and breaks through her traps and defenses and subsequently frees Hinata. Annoyed at her enemies escaping, she decides goes back to their hideout to plan their next move, but Kabuto comes in and explains another plan. Kabuto, Guren, and her men go out to the lake so that they can awaken the Three-Tailed Beast. When it appears she tries to restrain it, but proves no match for its strength, the whole time holding Yukimaru in a protective hug. When she uses the last of her chakra to save Yukimaru and the others, she later awakens to find herself in the care of Yukimaru. Guren then finds herself having a dream about the her childhood with Orochimaru and dreams about a woman. After she awakes, she finds that Yukimaru is sick again, speculating that it was because of Kabuto's overdose of pills. While taking care of Yukimaru, she detects Naruto coming and intercepts him. After a short scuffle, Yukimaru appears to stop the fight. It is here that Guren hears another view of Orochimaru from Naruto, making her question the path she has taken. While returning to the hideout, she hears Yukimaru play with a grasswhistle and perform a melody she remembers. She then realizes to her horror that it was her who killed Yukimaru's mother. Upon the revelation, Guren begged Kabuto to not put Yukimaru through anymore pain, instead offering her own services to stop the Leaf Ninja from sealing away the Three-Tails. With the help of Rinji, Guren was able to stop the seal. Unfortunately, the Three-Tails then turned its attention to Guren. Luckily, Yukimaru was able to save her by using his powers to stop the Three-Tails. After seeing how desperate Yukimaru was to protect her, Guren's guilt towards the boy became greater than ever, knowing that the boy was clinging to the person who had killed his mother. Deciding to atone for her crimes to Yukimaru, Guren chose to do everything in her power to protect him. Despite being battle-worn and low on chakra, Guren attacked the Three-Tails head-on. Fortunately, Naruto soon appeared the and the two grudgingly worked together to battle the beast. Ultimately, the Three-Tails managed to capture and swallow the two whole. Inside the beast, Guren is surprised to see Naruto there as well. She tries to attack him, but the injury she sustained earlier caused her to pass out; when she came about, she became even more surprised that Naruto without hesistation treated her wounds. The two quickly begin arguing about where Yukimaru belongs. Guren states bluntly that she refused to let Yukimaru succumb to any harm. When Naruto accuses Guren of using Yukimaru's abilities for Orochimaru's benefit, Guren retaliates that the Leaf Village being barely any different, only interested in obtaining more demons to create more Jinchuriki, now that they've learned of Yukimaru's ability to tame the Three-Tails. Naruto quickly replied that his Village had no interest in the Tailed Beast itself, Guren calls him a liar, apparently aware that the Hidden Village already owns the host for the Nine-Tailed Fox. Naruto stops her train of thought by revealing that he is that very Jinchuriki, but one whom, for most of his life, his own Village did not treat as a proper being (much less their ultimate weapon), but rather, a living memory of the horrific catastrophe that the Tailed Beast which now resides within himself once wreaked upon the Hidden Leaf. Upon learning that Naruto refuses to use his demon powers in fear of hurting his loved ones, she begins to see that Naruto genuinely is concerned for Yukimaru's well-being. Together, the two begin looking for a way out of the Three-Tails. As they found themselves being cornered by the mini-Three-Tails, Guren felt compelled to admit to Naruto her hand in causing Yukimaru's loneliness. After revealing the truth, she decides that Naruto is right, that Yukimaru's place should not be with Orochimaru nor her, but with Naruto. Her sincerity towards this statement is proven by her desire to make sure Naruto gets out alive. To her surprise however, Naruto says she has changed and can make up for her mistakes. Together, they manage to escape the Three-Tails. Unfortunately upon escaping, they discover that Yukimaru is again being used to control the Three-Tails. Along the way, Guren has doubts about revealing the truth to Yukimaru, but Naruto convinces her to prove her sincerity of protecting Yukimaru even if refuses to forgive her. Being inspired by this, she and Naruto arrive in time to save Yukimaru from being forced to take a strange drug from Rinji, who turns out to be Kabuto in disguise. Kabuto decides to reveal the truth to Yukimaru, to which Guren makes no attempt to stop. To her shock and joy, Yukimaru decides to forgive her. The two then admit to how much they mean to each other. Guren leaves with Yukimaru under Naruto's orders, and Kabuto summoned the deceased Rinji with his reincarnation jutsu, and Guren battles him in an attempt to protect Yukimaru. Taking no chances, she used her signature Crimson Fruit jutsu to keep him safe. Guren tried to trap Rinji in her Crystal Jutsu, but he used his bats' supersonic abilities to shatter the crystal, saving himself and subsequently stopping Guren from using her Crystal Style. Devoted to protect Yukimaru with her life, she went behind Rinji and kept his hands apart, to now prevent HIM from using jutsu and controlling the bats. Though unable to perform any hand signs (with her hands busy holding back Rinji's arms), Guren still managed to use the Crystal Style and crystallize herself and Rinji. The two fell into the water below. Gozu later saves her. Yukimaru later joined up with them, and the three of them left together. Guren possesses a unique ninja art; the Crystal Release. It is not clear that it is a kekkei genkai or a power unique to her, also Guren made it clear to Kakashi that he cannot copy her techniques with the Sharingan. By using this power, Guren can summon and manipulate crystal in a number of ways such as creating crushing walls or unique shuriken. It is stated by Kabuto and by Kakashi that she can crystallize moisture in the air, therefore giving her an infinite source of weapons. The density of this power appears to be very high as even the Wood Release was unable to penetrate it. This ability is presumed very powerful as Orochimaru at one point desired it for himself. In times of desperation, Guren is also able to convert a small portion of her life energy to access extra chakra reserves to allow her to continue fighting at full strength for a short period of time. Guren's taijutsu skills are also rather high as she was able to fight on even grounds with an expert like Kakashi, dodge multiple Rasengan attacks from Naruto, and fight Lee and Tenten simultaneously. She is talented at noticing weaknesses in her opponent and using diversions, shown in how she kept the rest of Team 8 busy fighting her clones while she takes Hinata as hostage. After that she is seen to tell Naruto what she feels about Yukimaru. In addition, Guren also has good senses and is a keen observer. She was able to tell when Kakashi and Yamato were near and she was able to conclude that the Sanbi was trying to protect it's eye just by watching the way it defended an attack.